Your Android™ smartphone or tablet can carry a lot of personal information and may be vulnerable to cyber threats. Norton Mobile Security helps deliver powerful, effective protection against stealthy new mobile cyber threats and online scams for your Android device and personal data. App Advisor+ proactively helps protect your smartphone against mobile threats such as malware, ransomware, adware and privacy leaks using our award-winning2, patent-protected app scanning technology. Wi-fi Security helps detect and alert you when a network you join is dangerous or under attack, to help protect your personal and financial information. Web Protection helps detect fraudulent and malicious websites and safeguard you from navigating to them when using your preferred browser, apps, SMS, MMS, email, or social networking sites. Device Security gives you several tools to help recover your lost or stolen device. We also let you know when your operating system has vulnerabilities, so you can take action to help protect your device against cyber criminals that could take control of it or steal your personal data. Free apps are good at telling you what benefits they provide, but they may not tell you their real "costs" App Advisor+ (powered by Norton Mobile Insight), when activated, automatically lets you know about malware, online privacy and other risks that are detected before you download from Google Play™ to help you make informed app decisions — and whether that free app is worth the final cost. 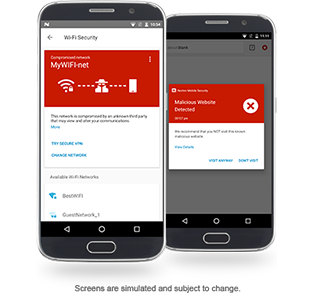 To help protect your personal and financial information from cyber threats, our Wi-fi Security feature uses advanced scanning technology to help detect and alert you before you join a dangerous network or one that is under attack. This helps you stop unwanted eavesdropping on your Wi-fi connection and makes it harder for cyber criminals to steal personal information or passwords, infect your device with malware, or use your Internet connection to perform illegal activities. Our Web Protection feature helps detect fraudulent or malicious websites when using your browser, apps, SMS, MMS, email, or social networking sites, to help safeguard your activities and personal information. Norton Mobile Security is powered by our cyber intelligence network system, developed by Symantec's Security Technology and Response (STAR) Team. 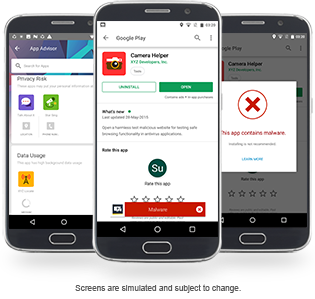 This includes Norton Mobile Insight, our proprietary app analysis system, which crawls app stores, analyses running apps and uses machine learning to understand Android app behaviours. Our engineering team strives to bring our valued members additional device, network and information protection in this increasingly unsafe cyber world. 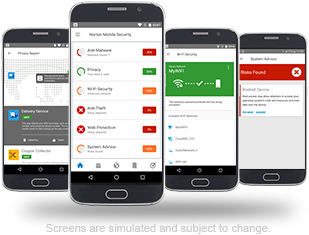 To learn more about the features included in the free version of Norton Mobile Security click here.